The Russell Screen Changer™ is an award-winning retrofittable screen deck lifting device designed to provide effortless inspection and replacement of mesh screens on circular separators. 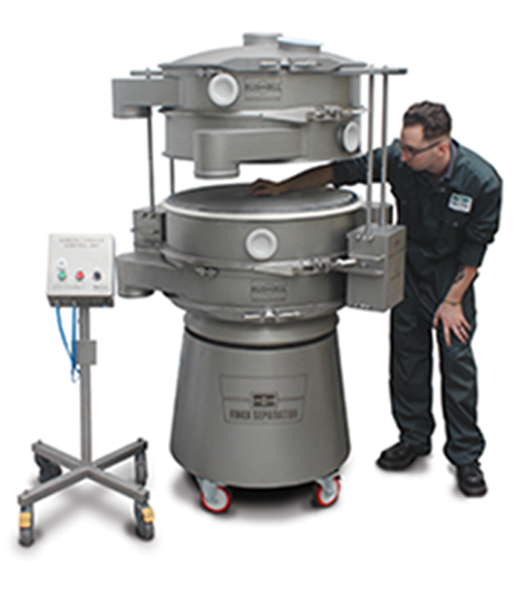 Utilizing two high performance pneumatic piston assemblies, multiple sieve decks can be lifted quickly and safely to a height which allows comfortable access to the screen requiring inspection or replacement. The innovative unit is compact, quick and simple to set up, fully mobile and easy to store. The latest pneumatic technology has been utilized to deliver a fail-safe interlocking safety system. The cylinders are locked perfectly in place, guaranteeing operator safety during maintenance. Even if the air supply to the machine is lost, absolutely no movement is possible. The technology allows this to be done during both lifting and lowering operations, automatically locking safely into place whenever the operator releases the control button. Durable, plug-and-play air lines are included with the unit, further improving usability during setup and operation. A fully stainless steel design provides maximum hygiene, meeting the requirements of food and pharmaceutical manufacturers. The Russell Screen Changer™ can be used on the Finex Separator™ and Russell Eco Separator®, as well as most single or multi-deck circular separators. Contact us for more information about how our upgrades can improve your production process.